Optimization. In the logistics industry, this term is vital. 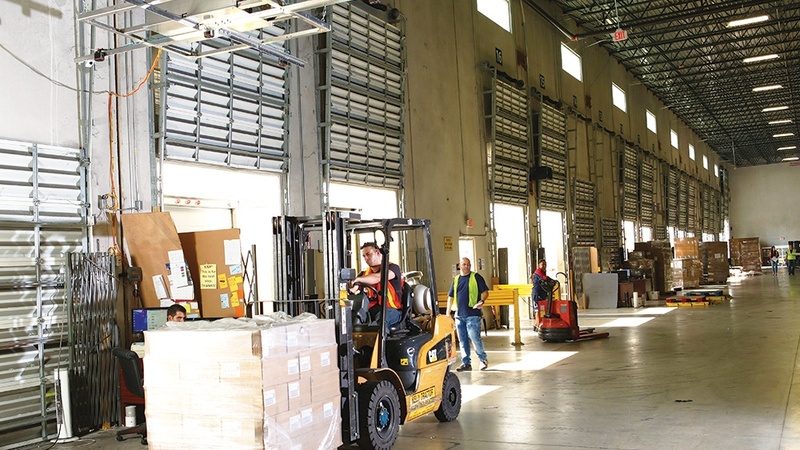 When it comes to optimizing logistics operations, every task and process must be analyzed and measured. Each individual business and operational process must be justified, simplified, and its processing time reduced. The compound effect of simplifying processes and reducing processing time yields higher efficiency and operational effectiveness levels. 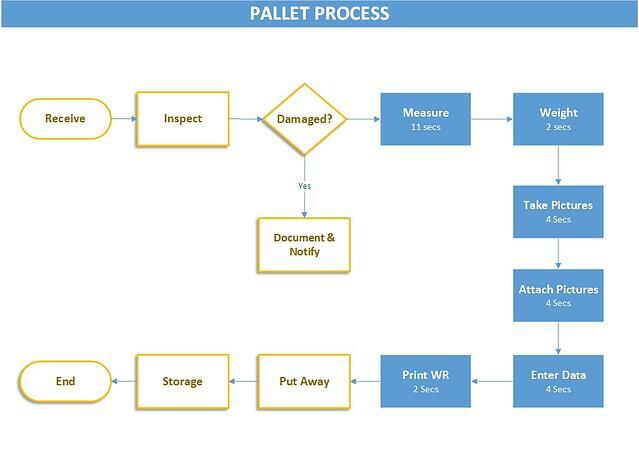 In this article, we focus on the pallet dimensioning process. We outline steps to optimize the overall process and automate as many tasks as possible. The first step is to optimize and validate the process. In this phase, the process must be documented, timed, validated and reorganized, if necessary. Let’s review one step at a time. 1. Document the Process and all its Tasks – if possible generate a visual representation of the process – you can use PowerPoint, Visio, or just pen and paper. Observe in real-time how each pallet is processed from beginning to end. Document at least 10 samples to ensure that the process is consistent and if variations occur note when they happen and why. 2. Measure Processing Time. Once you have a clear and consistent visual representation of the process and all its tasks, the next step is to measure how long each task takes. For this, a stopwatch is very helpful, but a regular watch will also work. Once completed, sum the time of all tasks to understand how long it takes for the entire process to be completed. Record this information. 3. Validate all Tasks. The fact that a task or process is being executed does not justify its existence. As companies grow, it’s normal for processes to change or become obsolete. Sit down with the clerks that process pallets, review each task associated with the process and confirm if each task is still needed. Ask two simple questions: Is this task required? If so, Why? Keep required tasks and eliminate as many unnecessary tasks as possible. 4. Re-arrange & Update Documented Process. Now its time to check if the current flow of tasks is logical and/or if they need to be re-arranged. Only after all tasks have been re-organized does the previous documented process need to be updated. 5. Validate Process Optimization. Now we need to validate whether the process was optimized or not. For this, run the new process at least 10 times in a production environment if possible. Time each task and document it. The sum of all the tasks should be less than the time of the original process. If higher, something went wrong and this exercise should be repeated. If lower, congratulations, you have optimized the process! If equal, your process was already fully optimized. Now it’s time to consider a technology to automate as many tasks as possible, reduce processing time and errors. The most effective technology to automate the pallet dimensioning process is a pallet dimensioner. A pallet dimensioner can help companies reduce pallet measurement time, labor costs, data entry errors and in some cases help refute damage claims. So, what steps should you take to select a system? Map Process’s Tasks to Product Features. Now that you have a well-documented and timed process, look for a system that can help automate as many tasks as possible. Because the main goal is to automate the dimensioning process you need to make sure that the system can accurately measure at least 90% of processed pallet sizes – take a 1 year sample. If you need to capture weight and pictures, make sure the system integrates with the scale and provides a digital camera as well. System Features & Capabilities. When looking at features and capabilities of a pallet dimensioning system ensure the system is capable of accurately capturing pallet dimensions regardless of the shape & package material. Also, confirm that the scanning speed is faster than the current time it takes to measure a pallet. Additionally, validate the system is NTEP certified and that it can be integrated with your current WMS/TMS/ERP. As per integration, check with your WMS/TMS/ERP vendor to make sure that you can integrate the two systems together. Some systems will integrate via API, XML, or any other form. Check with the WMS/TMS/ERP vendor whether the integration will incur any recurrent costs. If the vendor has recurrent integration costs, you can avoid this with an indirect integration. System Capabilities Vs. Optimized Process. After selecting the most appropriate system compare each process’s tasks and how the system can automate as many of these tasks as possible. The system must at least be able to automate the capturing of a pallet measurements, weight, and picture(s) of cargo. Now do the math and estimate how much time and how many errors will be minimized if the systems is implemented. On average, we see customers optimize their process by at least 80%. The example below shows how a customer optimized their process. The decision to buy a pallet dimensioner must be based on direct benefits (productivity increase, cost savings, etc. ), incremental benefits (ability to attract/retain customers, etc. ), cost avoidance benefits (growth without having to hire new employees, etc.) and intangible benefits (increase visibility, accurate/certified dimensions, customer confidence, etc.). If you have optimized the pallet dimensioning process and selected the appropriate technology, the company becomes more efficient, effective and competitive. You should not stop at optimizing one or two operations/business process. You must review each process and audit them frequently to make sure they are serving business and customers’ interests. Kill as many unnecessary processes & tasks and automate as many as possible.